Many people will often save their money for years and years to buy a new luxury car, in order to get a fully enjoyable experience when they drive day to day. However, there is a much easier way to get that luxury experience without breaking the bank. Buying a pre-owned luxury car give you a ton of the same great features at a way lower price point. Here at Certified Autoplex, we want to help you find your next used luxury car by highlighting the various vehicles we have available. Here, we will be taking a closer look at the Lexus ES 350 sedan. As the luxury off-shoot brand of Toyota, Lexus vehicles provide drivers with a great blend of practicality and comfort. 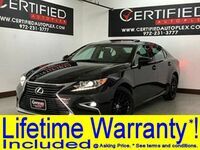 In particular, the ES 350 sedan has great engine power, fuel efficiency, luxury features and more that drivers and passengers alike are sure to love. Read more to take a closer look at our available models of the Lexus ES350. If you are in the Dallas TX area and are considering a used Lexus ES 350, follow this link to our inventory. We currently have three available models of the Lexus ES 350, all of which are from the 2014 model year. In a variety of different ways, this is an unbeatable sedan. Let's take a closer look at the performance, luxury and comfort features of the ES 350. In terms of performance, the Lexus ES 350 provides drivers with an excellent combination of power and efficiency. The ES 350 has a 3.5L V6 engine that can generate up to a whopping 268 horsepower, which is a ton of get-up-and-go for a sedan. Many vehicles have to sacrifice fuel efficiency for engine power, but the Lexus ES 350 still manages to get up to 31 miles per gallon on the highway. In terms of interior comfort, the Lexus ES 350 is designed for every person in the car to have a fantastic experience. Some of these comfort features include climate-controlled front seats, 8-way power seat direction control, dual-zone automatic temperature control, 42" of front legroom, 40" of rear legroom and more. Finally, there are a ton of amazing technological features for convenience in the Lexus ES 350 that will be incredibly useful in your day-to-day driving. These features include heated side mirrors, remote keyless entry, stolen vehicle tracking, parking assist, USB ports, adaptive cruise control and more. Interested in a Lexus ES 350?